Click the Offset button on the Home tab’s Modify panel, or enter Offset and press Enter. Type an offset distance and press Enter. Alternatively, you can indicate an offset distance by picking two points on the screen. If you choose this method, you should normally use object snaps to specify a precise distance from one existing object to another. Select a single object, such as a line, a polyline, or an arc. Point to one side or the other of the object and then click. It doesn’t matter how far away from the object the crosshairs are when you click. You’re simply indicating a direction. Repeat Step 3 to offset another object, or press Enter if you’re finished offsetting objects. 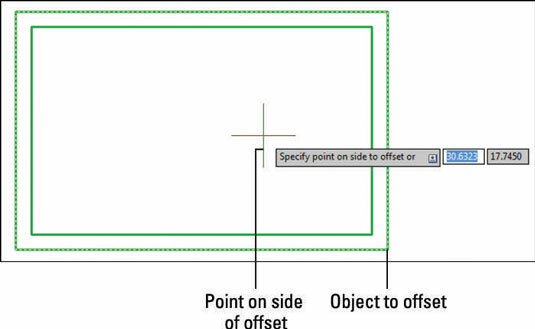 For information on the command options — Multiple, Erase, and Layer are all useful options — look up OFFSET in the online Help system’s Command Reference section. If you want to offset a series of connected lines (for example, a rectangular house plan outline), either draw it as a polyline or convert the individual line and/or arc segments into a polyline with the Join command. If you draw a series of line segments with the Line command and then try to offset the segments, you have to pick each segment and offset it individually. Even worse, the corners usually aren’t finished in the way you expect, because AutoCAD doesn’t treat the segments as connected. You avoid all these problems by offsetting a polyline, which AutoCAD treats as a single object.